Small Town Hearts follows Babe, who lives in the lighthouse of her small town that attracts a fair share of tourists and visitors during the summer months. When she meets Levi, an artist, she must remind herself of a very important rule: never fall for a summer boy. But when she finds her friendship with her two best friends crumbling, and her ex-girlfriend back in town, falling for the wrong boy may just save her summer. Lillie Vale’s writing style is amazing. Her voice is the perfect blend of the humor and wit that’s now a must for lighthearted contemporary romance, and the elegant proseof heavier, sometimes denser reads. It sets the tone for thisfun, adorable, yet grounded story. It also helps to vividly portray the town of Oars Rest, which is probably one of my favorite aspects of this book. I grew up in a small beach town that can get touristy, and the entire time I was reading this book, I kept seeing my hometown. Lillie Vale’s portrayal of Oars Rest made me remember why I love my town so much. There are a lot of things going on in this book, but it never feels heavy. There is constant action, angst, and dramastirred by the various relationships (romantic, platonic, and familial) and the unique events of an Oars Rest summer. No moment is dull, there is always something interesting happening, and always something you’re waiting for, dreading, or anticipating. Not only was the setting crazy relatable for me, but also the characters. Babe is such a fascinating protagonist, with flaws that hit home a little too hard, and so many great strengths. Her character growth over the course of this book is amazing! Meanwhile, her best friend, Penny, was equally grounded. I want to go on about her more but I don’t want to give anything away, but let’s just say she struck a nerve with me. That was one thing I really adored with this book. There were no cliche mean girls in this book, which is something that you see in YA contemporary too often. Instead, you’re given down-to-earth, scarily realistic characters that will remind you of people you know in your life, both for better and worse. The romance in this book is absolutely adorable, and Levi is such a great love interest. Also, I was so happy to see a bi main character fall in love with someone of the opposite gender and no one calls her straight or minimizes her sexuality! Honestly, everything with the LGBTQ+ rep in this book was amazing. I was so happy with how her ex-girlfriend was handled. She was still in the closet while they dated and broke up, and I loved that she was never blamed for not wanting to come out, and that Babe respected her privacy and protected her secret even if led to more issues for her. It was just really great. 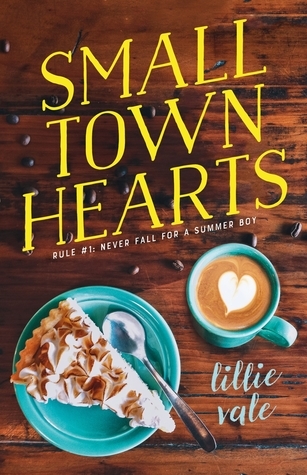 Small Town Hearts should be added to everyone’s TBR. It’s adorable, fun, yet full of heart and depth. This is a book you can’t miss!